We live an age of technology. Digital media pervades virtually every aspect of our lives. Social media, online applications and websites are causing us to relinquish more and more personal details into the depths of cyberspace. What are the implications of living in a world of individuals without individuality, where online vitality trumps the original? The Necessary Stage wraps up its impressive 30th anniversary season with a play that takes a long, hard look at the future and reveals the tyranny of technology. 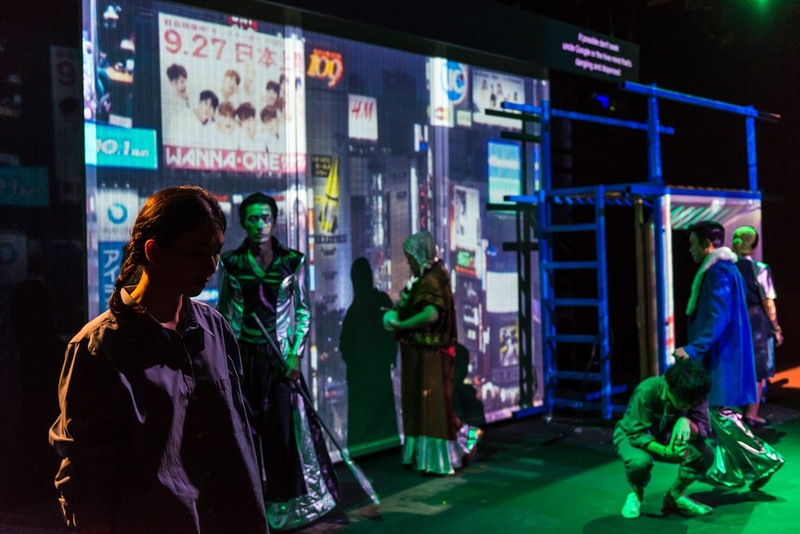 This collaboration with forward-thinking Japanese theatre company Hanchu-Yuei sees a return to the multimedia-saturated, non-linear storytelling that characterizes so much of TNS's oeuvre. Peppered with resonant themes and slick execution, it makes for a fascinating production. 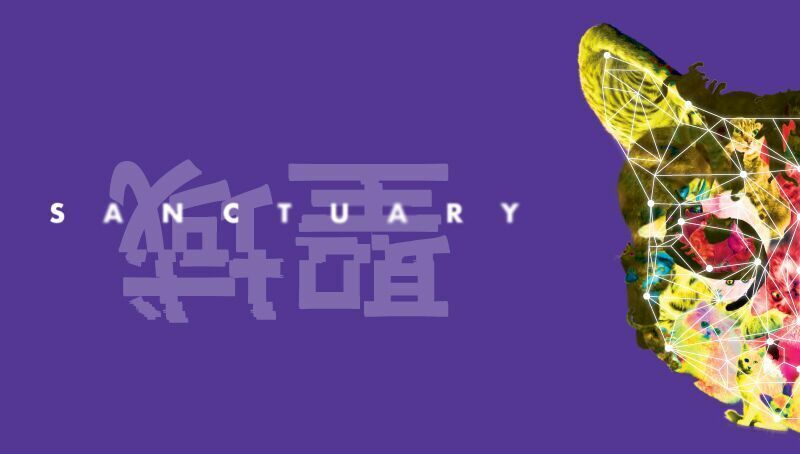 A mechanical voice introduces us to Sanctuary, a pervasive social media platform of the future that has amassed a whopping 7.4 billion users around the globe. Users connect seamlessly with others located anywhere in the world through their digital avatars. In a manner not dissimilar to the social media marketing of today, commerce is perfectly integrated in this ecosystem: conversations about cats amongst users immediately trigger advertisements of cat food. The users of Sanctuary span the gamut. Merah (Yazid Jalil) is a flighty social media influencer, throwing around his number of followers like a badge of honour. By contrast, grinning android cleaner Mac (Kan Fukuhara) craves a personal connection with another person but is scorned by the human users and remains an outcast. Elsewhere, a blind woman (Fumi Kumakawa) sings about 'naked' inanimate objects and a restless young man called Crocodile Ricky (Sachiro Nomoto) tries to make the most of his twenty-four minutes of free time every day by streaming videos of Crocodile Dundee. Yet, not everyone is motivated by fame, friendship or fun. In a heartbreaking filmed sequence, we watch a terminally ill woman with cancer (Audrey Luo) recording messages to be played on the birthdays of her children. As she is told by a machine to prepare herself for the next clip, her emotions slowly get the better of her. Her digital self now lives on in the platform permanently, haunting her daughter (Elison Tan Yuyang). This form of social media legacy planning is something one can easily see happening in the near future, a way for people to preserve a version of themselves for posterity long after their physical bodies leave the earth. Yet, can it ever replace real human contact? Sanctuary strikes a chord because it draws heavily from our world while taking things to an uncomfortable yet entirely plausible new level. Integrated advertising platforms and digital human archives are already making their presence felt. Our lives are increasingly under surveillance. It's no leap to imagine a time where one's only validation is obtained online. Sanctuary, then, is exactly what it means: a refuge from the harsh realities of the everyday world, a means for these people to dissolve their physical identities and reinvent themselves online. Co-directors Alvin Tan and Suguru Yamamoto (who also co-writes together with Haresh Sharma) have the performers fluidly conversing with each other in English and Japanese and extract spirited performances from the ensemble. 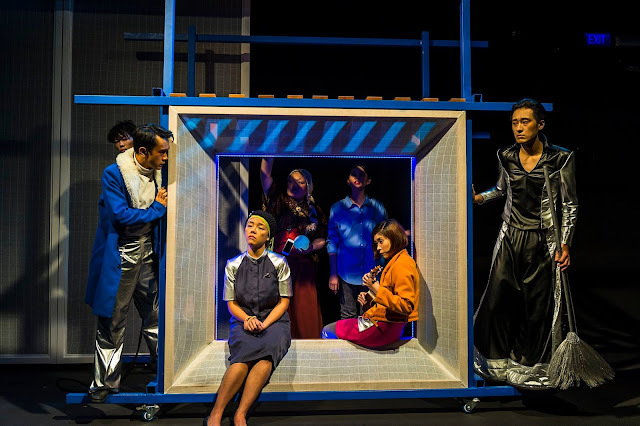 Set designer Vincent Lim uses a basic template of translucent sliding doors and a single moving platform with a square window, props that take on vibrant futuristic tones when augmented with the multimedia elements. Words, videos and other visuals float across the space in rapid succession, giving one the impression of an all-encompassing world. Yet for all its kaleidoscopic detail, Sanctuary seems to branch into disparate fragments that do not quite cohere. Even at sixty-five minutes, there is some drag and the varying storylines take on the feel of a sketch show. One longs to delve into the lives of these characters, perhaps even see their real selves, but there isn't much chance. Abrupt tonal shifts from drama to broad comedy feel disjunctive. A long Arabic speech preaching togetherness and tolerance in this online community, delivered by the character of Merah with the air of a religious leader, seems almost part of another play. With Sanctuary, TNS and Hanchu-Yuei remind us that for all the sophistication of a fully-integrated digital world, it is a place somehow devoid of humanity. Sound artist Bani Haykal sits quietly at a side table throughout the production, mixing tunes on his laptop and contributing to the discordant aural atmosphere. It is only when he breaks, unexpectedly, into song that we truly acknowledge his presence. Indeed, there is no humanity without the human touch. *Do check out my reviews of the other productions in The Necessary Stage's impressive 30th anniversary season: Actor, Forty, Those Who Can't, Teach, Being Haresh Sharma and Drip/Whale Fall. Hello Naeem! Thanks for the review :) Just a wee note: could you amend our Set Designer's name to Vincent Lim please? Sorry for the trouble and thanks for your support! You're welcome! Thanks for catching this - done!